Trent Reznor and Atticus Ross have written the soundtrack to the upcoming film “The Social Network” and have made available a free 5-track EP of music from the film score. Physical copies of the soundtrack, including a standard 19-track CD, 19-track Blu-ray Disc, and two 180-gram vinyls will start shipping in October. The CD will be the first to release on Oct. 11, followed by the Blu-ray Disc (audio content only) on Oct. 18 featuring a 6-panel digipak with lossless stereo and 5.1 surround sound. Lastly, the vinyls in triple gatefold package will ship week of Oct. 25. You can get the free 5-track EP by visiting this site and submitting your email for a link to download a compressed zip file. Pre-orders of the physical media will also get you an immediate download of the 5-track sampler, as well as a full album download in 320kbps MP3 delivered to your email on Sept. 28. The full digital download will also be available for purchase on Sept. 28, via Amazon.com . 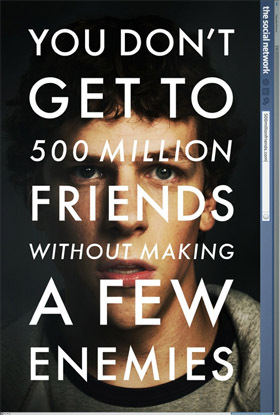 “The Social Network,” directed by David Fincher, opens in US theaters on September 30, 2010. The film is also opening in theaters worldwide starting Sept. 30 through Oct. 28.